Want to learn how to create an automated development workflow? An automated workflow helps you out with tasks you do when creating websites. It can help you free up loads of time, and make projects fun again. The greatest benefit I got from creating a good workflow is the removal of tedious, manual work. Now, I get to focus on the more fun parts of work like the creative tasks. I have also experienced a drop in the number of errors, simply because it becomes easier to handle work since Gulp is doing all the error catching for me. Just imagine you managed to free up one hour a day by using an automated workflow. How would you use this time? Would you create more awesome projects, design insanely creative websites, or would you spent it lazing on the couch with the comfort of your family? Now, imagine if you could free up one hour a day for everyone in your team. How much happier would they be? How much faster would things get done? What would everyone do with the extra time? So, what’s an automated workflow? Updating a file whenever it is changed so you don’t have to run a command to update it. Refreshing the browser automatically when needed so you don’t have to alt-tab and hit the refresh button manually. Letting you know what errors you made in your code so you don’t have to spend hours in frustration trying to find out what went wrong. Letting you write modular code (even HTML) so you don’t have to update that god damned navigation five times whenever something needs to change. Testing code whenever a developer merges the code to a central repository to make sure that everything works well. If it’s doesn’t, you’ll know it before any of your customers does, and you can make the necessary changes before they even know it. Deploying your website with a single command so you can remove the anxiety from being afraid that you’ll mess up the deployment process you can in place. There’s a ton of things you can put together to make a superb workflow! However, creating such a workflow is difficult. It’s especially difficult if you try to do it yourself. Furthermore, nobody seems to talk about putting a workflow together. So you’re totally on your on when you try to piece bits of information together to make a sense of what’s really happening. The worst thing is, even if you manage to get something working, you’re still be unsure whether you did everything correctly. There’s always going to be this nagging feeling that parts of your workflow can be improved. But you just don’t know how to go from here. If you do this alone, you’d have spent weeks or months getting to a workable solution. Do you have the luxury to spend so much time crafting your workflow when you have a deadline looming over the weekend? So let me help you get there in less than a tenth of the time. I’ll show you everything I know about creating a solid workflow. Here’s what we’re going to do in this book. The web industry evolves much faster than we can keep up. It’s normal to feel overwhelmed and confused when faced this jungle of tools. We’ll first go all the way to the basics, like learning to use the command line. Then, I’ll show you a six-part framework that helps you organize all the tools available to you in this jungle. You’ll forever know how does each of these tools play in your workflow. Finally, we will walk through how to put together an automated workflow, step by step, with simple to understand instructions. This workflow will do all the things we mentioned above, and many more. By the end of this book, you would not only have a good workflow to boot, you would also have gained the knowledge to create a workflow for your personalized needs whenever you want to. You will never again be at the mercy of waiting for someone else to create create a plugin, or a starter kit you desperately need for your projects. Since only one person needs to know how to make a workflow, your team will (hopefully) thank you for making their lives easier. Every developer I worked with was amazed at just how much easier they can develop with a solid workflow. The best part? You don’t need to be an expert developer to create an automated workflow. We’re going to start from the basics of basics and work our way up. I’ll guide you through this entire journey, step by step, until you get the hang of it. So don’t worry if you don’t know the command line, or think your coding skills aren’t good enough. All you need is to be interested in developing your workflow, and be willing to get your hands dirty with code. "Automating Your Workflow" is a complete collection on how to automate your workflow. Zell goes through a difficult topic that is often partially explained by other people. After reading through the book, I found that a lot of the automation is much easier than I expected. Zell really makes an amazing effort to deliver good content in an engaging and easy to understand manner. I highly recommend "Automating Your Workflow" because it'll get you automating your workflow in no time flat! Sounds awesome? Get 10 Chapters for free! Ten chapters is a quarter of the book. In these first ten chapters, we’ll talk about your heart burning questions like how to choose what tools to use for your workflow, and how to learn the absolute basics of Gulp. At the end of chapter 10, you’d have crafted a decent workflow that already saves you a lot of time. 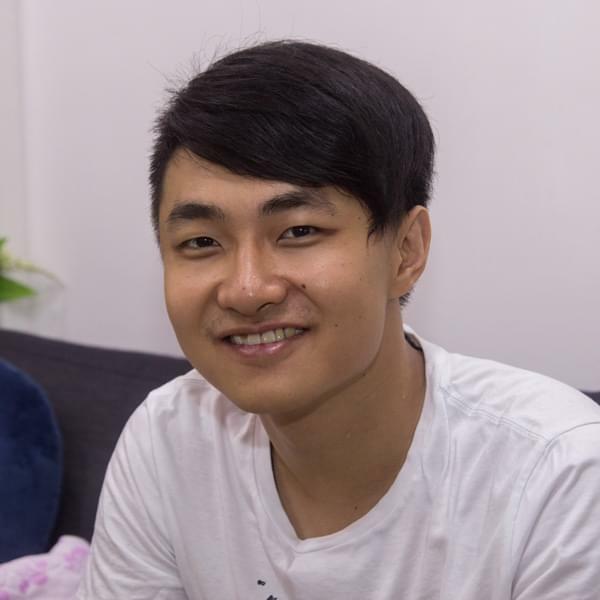 I'm Zell, a freelance web developer. I find it unbearable to work on something manually when I can automate it and free my time up. This led me to experiment a lot with workflows and build tools. It took me months of trial and error to get the workflow I created for myself today. Now that I’ve done it, I realized that it’s easier to make your own customized workflow than you think! It’s hard work, but you can get there in a fraction of the time I took. There’s a total of 8 sections, with 42 chapters worth of content. (Note: Hey! AYW was written 2 years ago. Since then, technology has evolved, so you’ll run into some errors in the testing phase. Don’t worry about the errors in the testing phase. They’re not going to stop you from creating the workflow you want. You’ll still learn the thought process and workflow you need to think about testing, which is the valueable part. Once you understand Gulp, you’ll be able to create your own testing phase with different tools out there as well). Here, we walk through the basics of automation and show you things you need to know before you begin the journey. This will be where you get knowledge of things like the command line, what goes in a development workflow, and how to use Gulp. We begin building the automated workflow at this phase, starting with the process of removing tedious and manual tasks you do. You will also learn how to use tools many modern tools for development. You will learn what to test for, and how to test your code with you having to eyeball them manually. You'll learn how to get a machine to test your code whenver you push it to a remote repository. Here, you'll ensure that you don't have to worry about your website breaking without knowing it. This is where you prepare your website for production. We reduce your asset sizes and do everything we can to make sure your website is wicked fast. What's more, everything will be done in one simple step so you don't forget anything. The deployment phase shows you different ways to deploy your website quickly onto your servers without having copy and paste your files by FTPing in manually. Updating your site becomes less of a headache. Here, you'll learn how to use the workflow with other projects. You'll also learn how to update project dependencies easily. In the last section of the book, we go through how to organize your Gulpfile, how to find good plugins to use and what to do next after you've completed the book. You never have to wait for someone else to create a plugin you desperately need once you learn how to do so. For example, I created my own plugins to create PDF, ePub and Mobi versions of this book because nothing else out there seemed to work. Learning to create plugins is key to unlock your ability to create any kind of workflow you want. You’ll learn how a Gulp plugin works, and how to craft one in this bonus. You’ll also get access to my personal static-site generator that I built with Gulp. This static-site generator is used to run my main website, zellwk.com, and other sites that I create. I’m always updating it, so you can be assured that you’re using the latest and bestest technologies that I know of. One Big Question: Is it worth it? If you value your time at $50 / hour and you save 1 hour / day, learning to automate your workflow would help you save 365 hours or $18,250 a year. That’s 246 X the amount you spent on the full package. What will you do with your extra $18,250 a year? What do others say about the book? It's thorough, relevant, well-paced and offers a wealth of information on the many ways a properly implement build system can help you simplify and speed up your web development. — Charlie Gleason, head of product at Unbound. 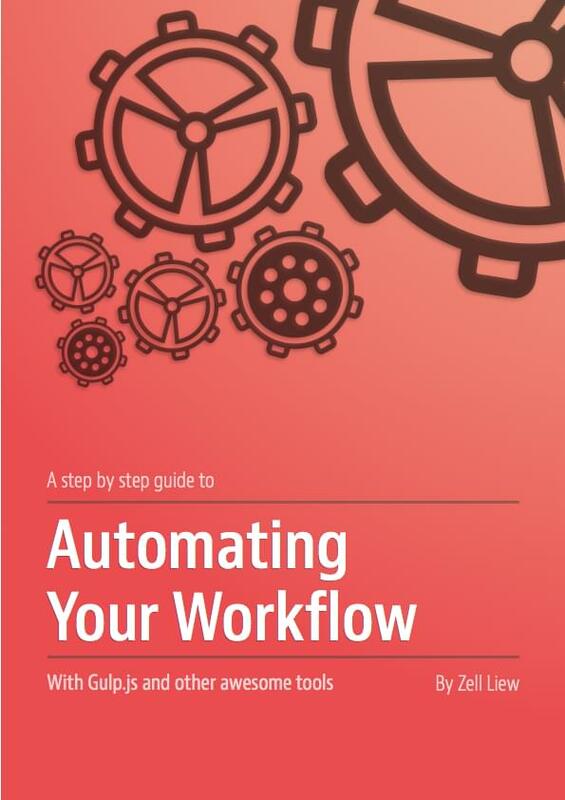 "Automating your workflow" is a gentle introduction to making your life easier by using Gulp. I found it extremely easy to follow along. The book discusses the steps in a workflow in a friendly manner and outlines all required code in detail. I got quite a bit of confidence using Gulp and I think I'll be able to use Gulp in a productive manner. Setting up my workflow will also be reasonably painless. Will this workflow work for everyone? Yes, the workflow we're building works on all operating systems. It doesn't matter if you use Windows, Mac or Linux. It'll work on everything. I'm afraid of spending too much time on creating my workflow. Building an automated workflow is one of the best investments you'll ever make for your development career because it will drastically shorten the time you spend on coding. What makes this different from the other Gulp books? This book is different because it doesn't focus only on Gulp. It aims to equip you with the knowledge to use any tool, even if something better than Gulp pops up. Plus, we're going to be making a real workflow. Which book does that? What if I already know Gulp? You're going to love the book if you're unsure whether you're doing things correctly, or if you feel that you can improve parts of your workflow. If not, free feel to skip this book. What version of Gulp are we using? We're using Gulp 3.9 in this book. (This book is written in 2016). I don't intend to upgrade the book. Yes, I only want your money if you're happy with the book. If you don't like it for any reason, just send me an email with your receipt within 30 days and I'll refund you. 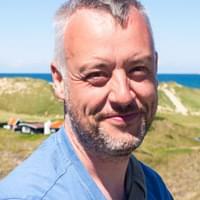 Feel free to look around my blog to find out more about how I write and teach. Just send me an email at [email protected] and I'll be back shortly with a reply. Ask anything you want! Are you ready to automate your workflow?